After keeping a close eye on the conditions of the Trails after the winter, the volunteer crew up at Castle Hill have been out tidying up some of the smaller windfall on the tracks and checking that the tracks are dry enough to officially open. We’re pleased to announce that the Craigieburn Trails are generally open for riding again this summer. It’s been pleasing to note that the hard work put in last year (not least by Scott & Kev at T5 Contracting) has resulted in the tracks holding up really well over the winter. Be aware that there are still some areas on Coal Pit Spur where trees have been blown down and the root balls have actually ripped up the surface of the track. We have upcoming maintenance scheduled to tidy those up, so if you see the signs out, please slow down and say hello. There are also still some tree trunks down across the tracks (e.g. on both Hogs Back and Dracophyllum Flat) waiting for a DoC-certified chainsaw crew to get in there and tidy up. Note that Coach Stream Route is closed to all users until the 20th November for lambing. 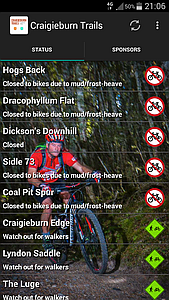 We’re also stoked to launch the Craigieburn Trails app for Android phones. As per our other fundraising endeavours, we’re also trying to make this a little bit of a fundraiser for the ongoing costs in maintaining and expanding the Trails so that you can enjoy riding them. The app provides up-to-date information on the status of all the tracks for free, plus details on the original, iconic, Hogs Back Track. A one-off, in-app donation (you have a choice of amount, with all proceeds going directly to track maintenance and development) will unlock all the juicy detail on maps, elevation charts and track descriptions for each of the rest of the trails in the network. If any bike-mad developer wants to work with us on a similar iPhone app, get in touch! We acknowledge the generosity of the following sponsors who are supporting the launch of the app; please do support these local businesses!